I picked up gilding flakes by Cosmic Shimmer this week and I was dying to try them. Jennifer McGuire and Julie Ebersole have both had videos showing this product. I used it with Versa Mark and Judi Kins Sticky Stuff. I have always loved the Hero Arts Brushed Frame woodblock stamp so I started with that, when I looked at the result (which I love) I though right away of the OWH Hero Arts Moose. I am from the province of Quebec, we see moose all the time! This is a perfect card for someone that I am thinking about that doesn't live close and this stamp set is one of my favorite Hero Arts sets that I own. 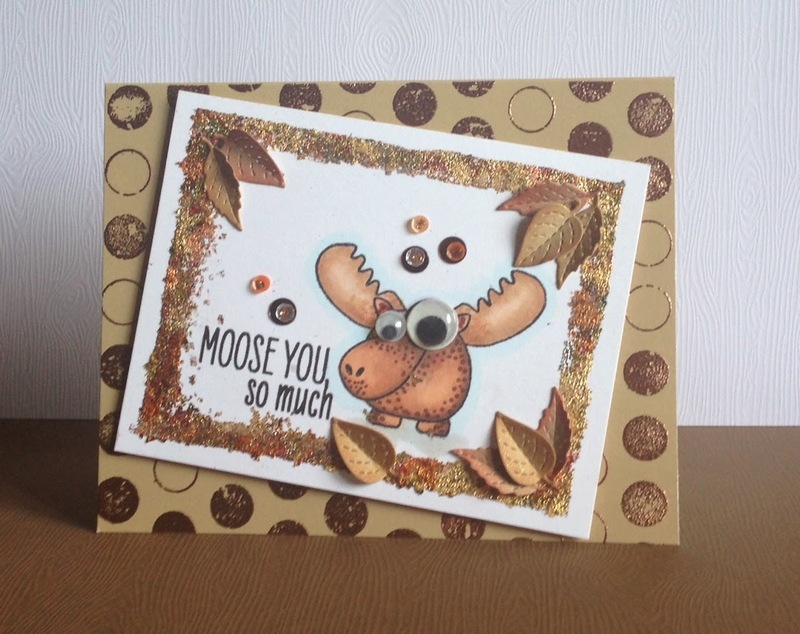 This is such a fun card Kim especially with those googly eyes! I love how you've used the flakes on your frame!